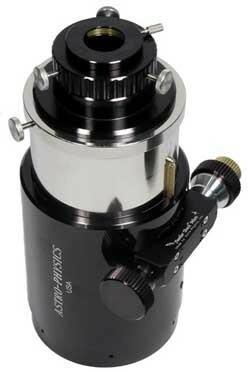 The silky smoothness of the robust 4" Giant Focuser and the dual-speed mechanism of the Feather Touch Micro are both realized in this superb focuser. The dual-speed feature is particularly advantageous for critical focusing of scopes with fast focal ratios. This focuser also features our new greaseless drawtube. Refer to the description and feature list above for dimensions and specifications that are in common with the standard focuser. The only difference between the standard focuser and Feather Touch models is the pinion/block/knob assembly. Who should choose this focuser? Upgrade scopes that already have prior version of 4" Focuser. These scopes include the Astro-Physics 155 f7 StarFire EDF, 180 f7 StarFire EDF and 206 f8 StarFire EDF. It may also include instruments that were manufactured by other telescope makers using our 4" Focuser or instruments crafted by amateur telescope makers (assuming that the original 4" focuser was not modified in any way). To upgrade, simply remove the six screws that hold the original one in place. Slip the focuser out and insert the new one. Replace the screws and you are ready to go. It couldn't be easier. Upgrade Astro-Physics 155 f7 StarFire EDF refractors originally sold with the 2.7" focuser. Choose this option if you plan to purchase the 4" Field Flattener for the 155 (S155EDFFF) or if you like the feel of an excellent large focuser. To upgrade, remove the six screws that hold the 2.7" focuser and the adapter piece ahead of it. You will notice that the new 4" Focuser is the same length as these two components together. Bolt the new 4" Focuser into place and you are ready to go. There are no collimation issues to consider. Amateur telescope makers. This focuser is also a first-class choice for the do-it-yourselfer who takes pride in constructing his/her own tube assembly (we no longer offer a separate unengraved focuser for ATMs; you are welcome to use the engraved version). If you are showcasing a fine large lens, this focuser is particularly suitable given its proportions and weight. You will need to offset the weight of the lens with comparable weight in the rear of the tube assembly in order to achieve a balance point near the center of the tube.